I am happy to let you know that my new book Rome a photographic tour has finally been published and it is now available. This is a travel photography book dedicated to Rome, the capital city of Italy, featuring many of my own photographs (such as this one or this one, posted some time ago on this blog). For the moment the book is available only in paperback but soon the hardcover version and the e-book will be released. I will keep you posted! You can see a preview of the book here: http://issuu.com/alexandruciobanu3/docs/rome_-_a_photographic_tour_-_previe/1. The book is available for sale on Amazon and on the CreateSpace estore. 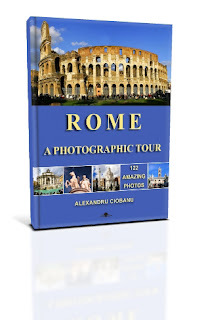 Rome a photographic tour has 86 full-color pages and comes in a large format of 8.5 x 11 in (21.59 x 27.94 cm). It contains 122 beautiful photographs which highlight all the important landmarks from Rome.